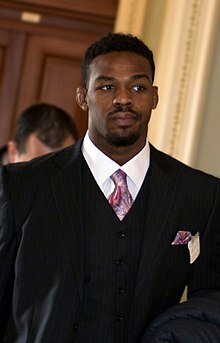 Jon Jones looking good in his new Wikipedia pic. Discussion in 'The Lightweights' started by TrumanBurbank, Jun 2, 2014. Everything he does makes news in sherdog. Amazing. Looks like he's at a funeral. Thanks for saving this thread. He is actually for his current title run once Gus or DC gets a hold of him. Looks scared. Probably sees Gus in the distance. Is he carrying a sleeping bag? He looks like Chris Webber.